The larger your order, the bigger your discount! Pick from 4 Standard Ink Colors (if you need something different, please let us know). All our inks are designed for incredible long-life durability, crisp clear print, plus super scratch and smudge resistance. This is a standard note for the printing industry: Colors shown on a computer screen may not match exactly to the printed products you receive, depending on the contrast and color settings of your computer monitor. 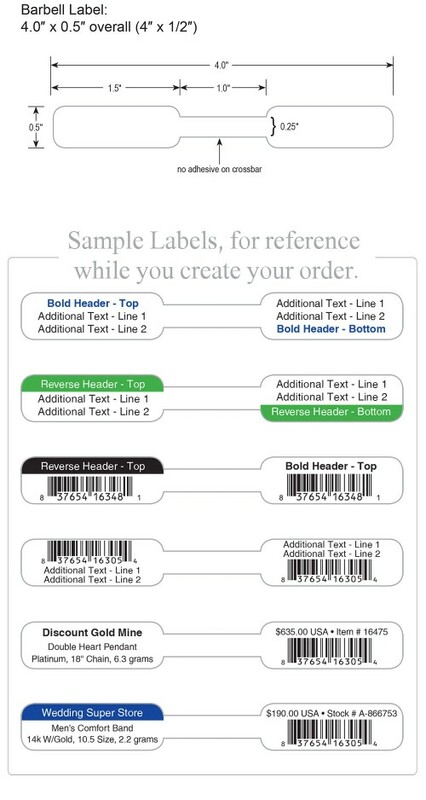 Choose a maximum of 2 different ink Colors to print on your labels. All Barcodes work best printed in Black ink. 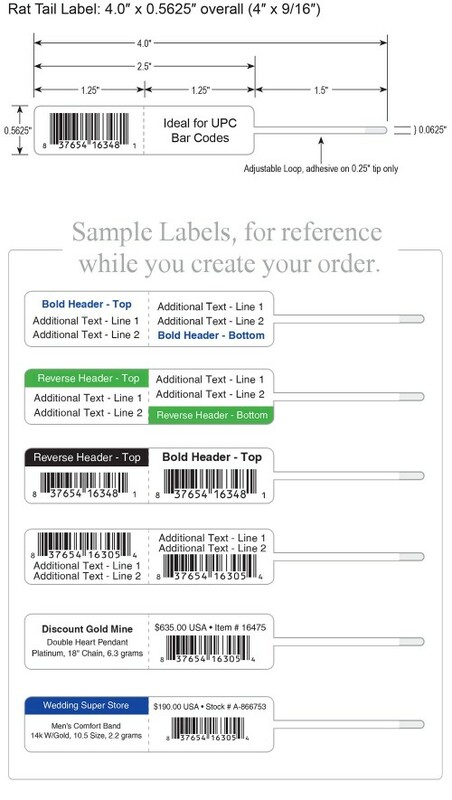 Our ink colors Blue, Green, Silver and Gold will also print readable barcodes, but they do not scan as effectively as Black. If you want a barcode, but you do not include Black ink on your label, we will print a colored barcode for you, but we assume no liability for its readability. Printing graphics, logos or tight registration requires approval from our Art Department before your order can be processed. Once you complete your order our experts will email a final proof for your approval. We do everything, design, proof, production and ship out your order within 3 business days or less, after your order is approved. Make the Barcode match the Consecutive ID Number listed above. 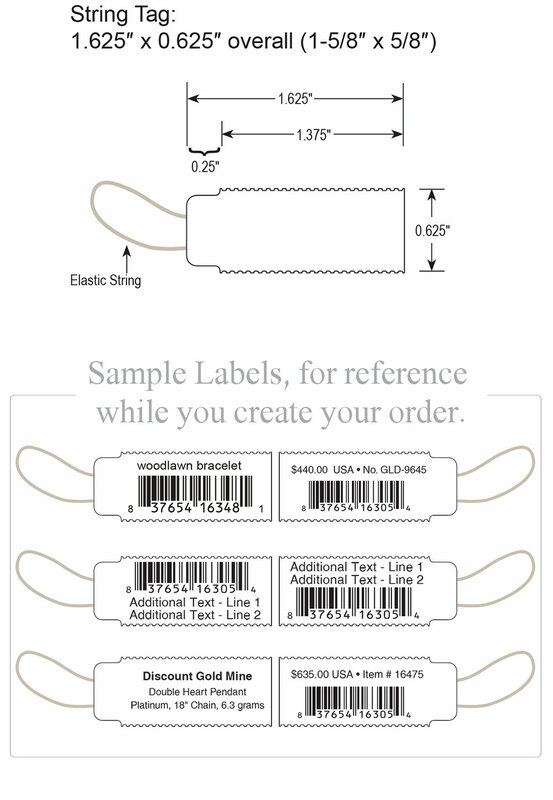 Elastic String Tags: Our elastic string tags are made of a sturdy gloss white paper tag material, and come attached in a continuous row with a tear-perforation between each tag to separate them. A loop of elastic string is already attached to each tag; the loop is 0.75″ long and can stretch to 2.0″ long. The print area is 1.375″ x 0.625″, which is wide enough for a barcode. We can print on both the front and back sides, and we can print in 1 or 2 colors (but only 1 print color per side; Black, Blue, Red or Green print are available, but no Silver or Gold print on this item). This is a great way to attach a price tag to items that are too large for barbell or long tail labels, like wide bracelets and watch bands. Get your Jewelry Labels and Tags fast. At the lowest price and fastest turn time. With guaranteed print quality and information accuracy.